VATICAN CITY (CNS) — Pope Francis called for an end to slave labor and human trafficking as well as greater efforts to create dignified work for more people. The problem of unemployment is “very often caused by a purely economic view of society, which seeks self-centered profit, outside the bounds of social justice,” he said, marking the May 1 feast of St. Joseph the Worker during his weekly general audience. The pope touched on the same theme during the homily at his early morning Mass, before a congregation of unwed teenage mothers and their children in the chapel of the Domus Sanctae Marthae, where he lives. “People are less important than the things that give profit to those who have political, social, economic power. What point have we come to?” he asked. The pope recalled a recent “tragedy” in Bangladesh, where more than 400 garment workers were killed when the building they were working in collapsed. The workers reportedly earned just $38 a month. “This is what you call slave labor,” the pope said. A society that cannot offer a person the possibility of work is a society that “has stripped this person of dignity,” he said. 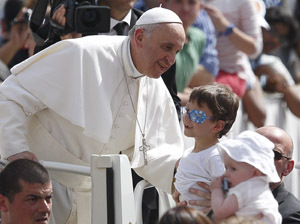 Later in the day, Pope Francis returned to the theme of work and dignity during his weekly general audience. More than 70,000 people turned out in St. Peter’s Square, many of them Italian families and children enjoying the May 1 Worker’s Day public holiday in Italy and many other countries. After a long tour around the square in the popemobile, the pope dedicated his catechesis to May 1 as both the celebration of St. Joseph the Worker and the beginning of the month devoted to Mary. He said the two saints represent two key facets of life: work and prayer. Work is part of God’s loving plan for humanity, who is called to participate in his act of creation, the pope said. “Work is part of God’s loving plan; we are called to cultivate and safeguard all of creation’s resources and this is how we participate in the act of creation,” he said. Work gives people dignity by allowing them to participate in God’s creation, support themselves and their families and contribute to the growth of their nation, he said. While he called for more solidarity toward the unemployed and greater efforts by government officials to reinvigorate employment opportunities, the pope also called on people, especially the young, not to give up hope. “There is always light on the horizon,” he said. The pope made a special appeal against slave labor and human trafficking. The pope also urged his listeners to remember the importance of prayer as the silent contemplation of Jesus and conversation with God. “It would be wonderful if, especially this month of May, (the rosary) were recited together as a family, with friends, in parishes,” he said.